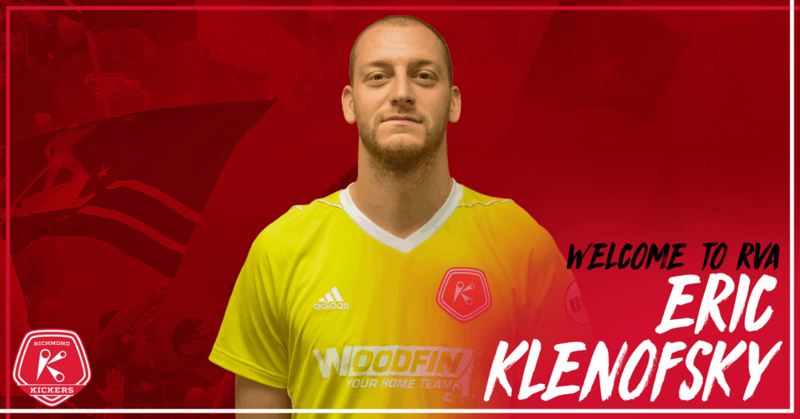 RICHMOND, VA – (Friday, June 1, 2018) – The Richmond Kickers are pleased to announce the signing of goalkeeper Eric Klenofsky. He will be available for selection this Saturday night as the Kickers host Pittsburgh Riverhounds SC at City Stadium. Goalkeeper Zachery Tashjy has been released in a decision made by mutual agreement. Klenofsky made one appearance with the Kickers in 2017, recording six saves in a 0-1 loss at City Stadium against Louisville City FC, while on loan from the Kickers Major League Soccer affiliate D.C. United. Drafted 34th overall by United in the 2017 MLS SuperDraft, Klenofsky joined the MLS side after four seasons at Monmouth University, where he was the two-time MAAC Goalkeeper of the Year. The Kickers continue their four-match homestand this Saturday night as they host Pittsburgh Riverhounds SC. It will be the Food Truck Fest from City Stadium starting at 5:30 p.m. as RVA’s iconic food trucks will headline the event with local favorites including Carytown Burgers & Fries, Sticks Kebob Shop, Freekin’ Rican, Backyard Grill, Intergalactic Tacos, Opa, Goatacado and Gelati Celesti, serving legendary tacos, made-to-order burgers, island flavors, authentic Greek fare, and heavenly hand-made ice cream. Then, the Kickers take the field to face the Riverhounds at 7:00 p.m. Tickets are on sale now at RichmondKickers.com and the game will be streamed through ESPN+.